Buffett Rule #1– Don’t lose money! Buffett Rule #2– Don’t forget rule number one! Buffett has always made sure that he focuses on the valuation of what he is buying. 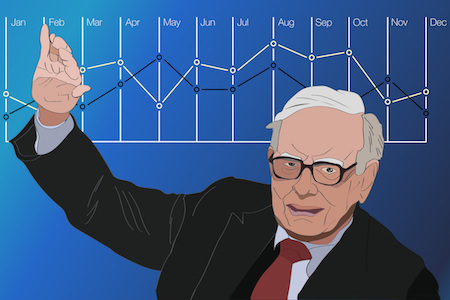 By making sure to buy companies when the stock market is valuing them inexpensively, Buffett has made sure to not take on risk of permanent loss of capital. For Buffett, investing has been all about minimizing downside risk. That is why I think he would love these two reinsurance companies today. When you purchase insurance, you pay the insurance company an annual premium in exchange for a contractual obligation that the insurance company will cover you against specific future risks. You give them cash today and somewhere down the line (1, 3 or 10 years) the insurance company provides cash if you suffer an accident, flood, or incur healthcare costs. The insurance company generally aims to turn a small profit on the difference between what you as a customer pay them and what they eventually have to pay out to cover your insured events. In the industry, the difference between premiums collected and the amount paid out is known as an underwriting profit. On average, insurance companies don’t make much money on underwriting. Where an insurance company really makes its money is through investing the cash that it collects from you as a customer before it has to pay that cash out to cover a specific event. There are often several years between when an insurance company collects a premium and when it has to pay something out. The insurance company gets to keep all of the investment income earned on that cash during those years. A reinsurance company does the same thing. The only difference is that the reinsurance company sells insurance to insurance companies who are looking to lay off risk instead of selling policies to you or me as customers. Since investment performance is what drives an insurance company’s profit over time, it is no surprise then to learn that great investors are attracted to the insurance business. For example, Warren Buffett’s company Berkshire Hathaway (BRK.A) is heavily involved in the reinsurance business. There are others, and today two of them are very cheap. Typically an insurance or reinsurance company will trade at a slight premium to book value. Book value is the value of a company’s assets less its known liabilities. 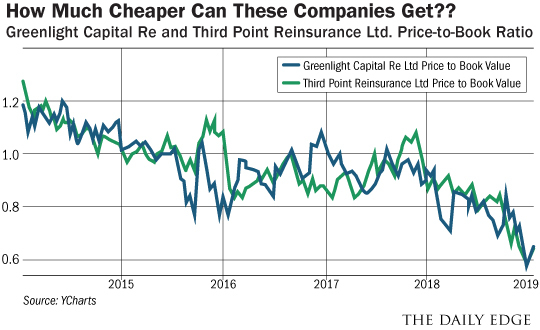 Currently, both Third Point Reinsurance Ltd. (TPRE) and Greenlight Capital Re (GLRE) trade at massive, unprecedented discounts to book value. The chart tells the entire story. Caught up in the stock market carnage of the last three months of 2018, both of these companies currently trade at only 63 percent of their book value. In theory, both of these companies could be liquidated tomorrow at book value. In order to get back to book value these stocks would need to rise by almost 60 percent. It is not unrealistic to think that both of these companies should trade at a slight premium to book value, they certainly at times have done exactly that. The investment portfolios of these two reinsurance companies are managed by two of the best hedge fund investors of the past two decades. Third Point’s portfolio is managed by Dan Loeb and Greenlight Capital’s portfolio is managed by David Einhorn. As of June 30, 2018, Loeb’s Third Point Ultra Fund has in fact returned 23 percent annualized after fees since it was formed in 1997. And David Einhorn’s Greenlight has returned an annualized 15% since he started the firm in 1996. These are both wildly better than the 8.7% that the S&P 500 returned over the same time period. And although Einhorn’s hedge fund had a very difficult 2018 investing-wise, his long-term (and more meaningful) track record is still exceptional so we won’t hold it against him. Couple the expertise of these legendary money managers with the fact that their reinsurance companies are trading at huge discounts to book value, and investors have a very good chance of generating a good sized capital gain over the next 18 months without much downside risk. These are two investments that even Warren Buffett would appreciate!